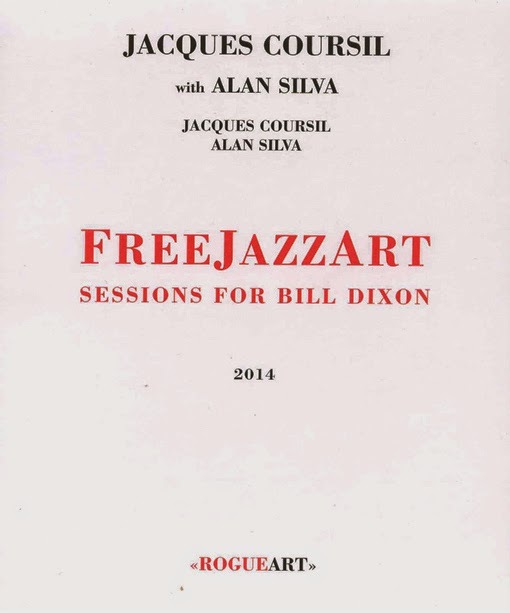 Jacques Coursil and Alan Silva are highly regarded musicians whose works in the 60s, especially on the BYG label in Europe, are well regarded amongst free jazz and experimental music fans. While Silva continues to play to the present day, Coursil had disappeared from the scene, pursuing a career in teaching, and re-emerged 35 years later with an album on Tzadik, called Minimal Brass. Here, they play together in a series of duets, recorded in three sessions, for the RogueArt label. For those who might be expecting a highly free form exchange between bass and trumpet, think again. The fifteen tracks, all untitled, that run for 43 minutes are like chamber music in their tone and play. Coursil's trumpet is soft but not gentle, part Miles Davis like in his formidable years on the Prestige label, part Coursil's own continuation of his prior album, very economic with notes, but full of flavor and purpose. Silva contributes with bowing and plucking of the bass, lurking underneath Coursil's trumpet, rarely leading or soloing but never fully in the background either. This is not for casual listeners. It should also be taken in small doses, because even at a relatively minimal time span for an album, it exhausts one's attention span. Every track has the same tone and sound, almost to the point of being monotonous. Coursil's playing can sound exactly the same from track to track, but on more focused listening one can hear the subtle dynamics of the exchanges between the two and the slightly different forms that take shape from track to track. Subtle is the operative word here. This album is an example of two veteran musicians at play, full of beautiful playing, but can seem repetitive, even for those who only know them from their earlier work. Too many caveats in this review! I recommend this one wholeheartedly. This record is unflinchingly direct, a paradox of meditation and confrontation. Deeply affecting. I can't listen in small doses because once I enter this sound I can't easily pull myself out. Just another opinion. I know almost none of Dixon's music; I hadn't listened to Coursil before and Silva very little (Andrew Hill's Strange Serenade is a favorite). I haven't listened to this, but it's nice to see Silva sticking solely to bass--his "experiments" with orchestral keyboard playing in recent years have always left me frustrated and wishing he'd just pick the bass back up. I'm glad you have a different opinion. I found this session very difficult to evaluate, but I have heard both artists in other contexts, and this is a completely different sound.